The major provides the basic undergraduate education required for private and public service in the surveying profession as practiced in the United States. 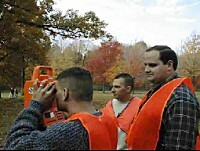 Particular emphasis is placed on fundamental surveying priniciples required in all areas of surveying. A basic introduction is provided in the main divisions of surveying including cadastral surveying, geodesy, photogrammetry, data analysis and adjustments, remote sensing, geographic information systems, and land development and design.